Please note that any applicant submitting more than one application will have their selection revoked. Any applicant found to have committed such an act will be disqualified and any funds they have transferred as surplus or duplicated payment will not be returned. False declaration of name, age, gender, nationality, domicile, records or any other matter is not allowed. Also, use of a substitute for any event or transference of entry rights are not allowed. Any individual found to have committed such an act will be disqualified and the organizers will not be required to make any compensation or return any funds. After an application has been made, no change, amendment, or cancellation can be made to the content of the registration for personal reasons. The secretariat will contact the applicant via the applicant’s email address or telephone number only if there is a need to confirm the content of an application. The organizers bear no responsibility for late applications resulting from problems with the Internet. 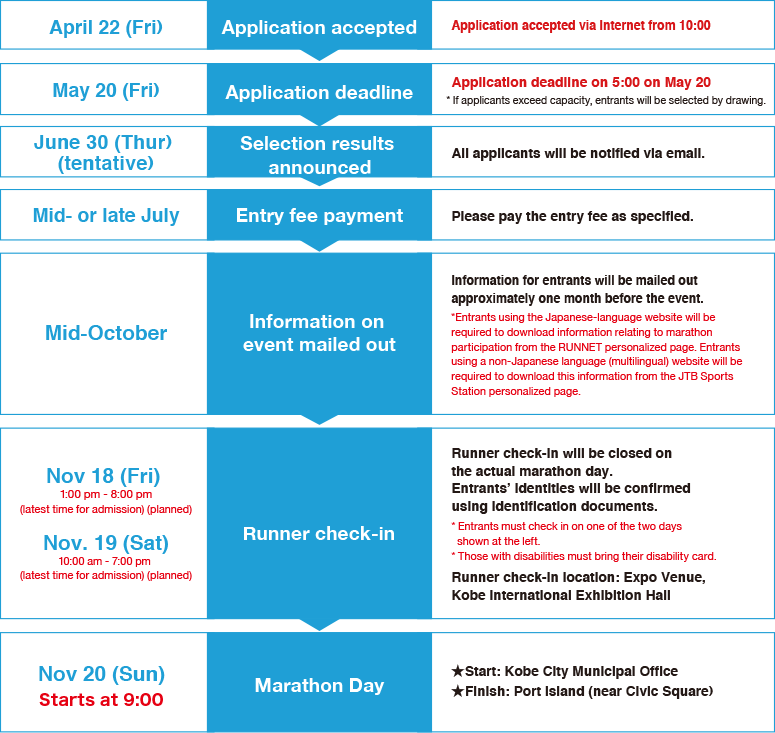 Entry fees will not be refunded in the event the Kobe Marathon is cancelled due to reasons beyond the control of the organizers (earthquake, wind or flood damage, snowfall, some sort of incident, accident, or disease, etc.). The organizers will not be responsible for entrants’ tardiness due to public transport or road traffic conditions on marathon day. In the event of illness, loss, or other incident, the organizers accept no responsibility other than to take emergency measures. At the event, including on the course, entrants are prohibited from wearing or displaying logos or trademarks representing a company or product name. The organizers will retain publication and portrait rights for such media as television, newspapers, magazines, or the Internet with respect to images, photos, articles, entrants’ names, ages, addresses (name of country, name of prefecture or equivalent administrative unit, or name of city, ward, town, or village), etc. The organizers will handle the personal information of the entrants in accordance with laws and regulations relating to the protection of personal information. This event shall be implemented in compliance with all the relevant laws of Japan. The organizers shall stage this event in compliance with the event stipulations as well as the terms of application. Please note that the Kobe Marathon Runner Call Center or secretariat will not respond to questions or inquiries about the status of an application or results of the drawing. When applying via the Internet, the computer terminal, operating system, or browser used by the applicant may prevent the applicant from being able to file his or her application. All applicants will be notified of the results of the drawing by email by Thursday, June 30. However, please be aware that the organizers will not be able to reconfirm the drawing results if the notification fails to arrive or goes astray due to a problem with the email provided by the applicant. Also, the organizers will take no responsibility whatsoever for any accompanying loss where email reception settings or security software settings prevent an applicant from receiving an email notifying them of the results of the drawing etc. Receipts will not be issued. Receipts will not be issued. Entrants are asked to substitute a copy of the transfer for an official receipt. The passage of emergency vehicles including ambulances may impede the progress of runners. In such cases, no records adjustment can be made to compensate for the time lost. The organizers may permit the commissioned sale of photographs and other approved products. Minors must obtain the consent of a parent or guardian for entering. For event-related matters not covered above, please follow the instructions of the organizers. 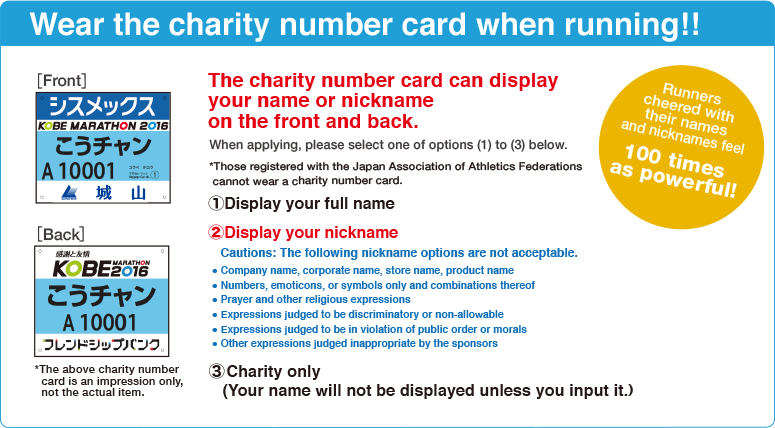 These guidelines are for Kobe Marathon 2016. Introduction of the Friendship Bank to provide a range of aid to disaster-hit areas in Japan and abroad. What is the Friendship Bank? KOBE MARATHON ALL RIGHT RESERVED.